Apple recently announced that cumulative app downloads for the iOS appstore have reached 50 billion. 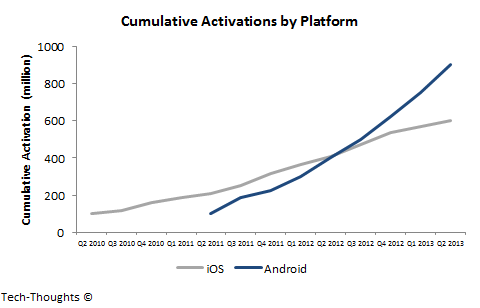 In comparison, cumulative app downloads for the Google Play Store have reached 48 billion. Most analysts have been quoting these figures, but haven't really dug deep enough to figure out what this means for the future of the mobile industry. 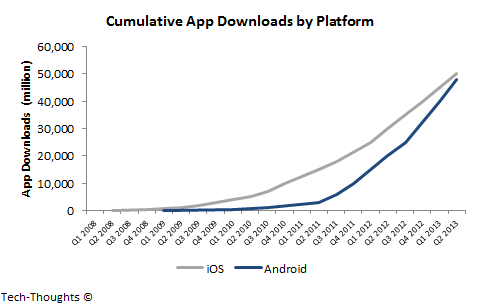 Let's take a look at the app download rate per device and attempt to understand its implications. The trend here is quite similar to the one above, with iOS seeing healthy growth and still outpaced by Android (Android devices here only include those with Google services). 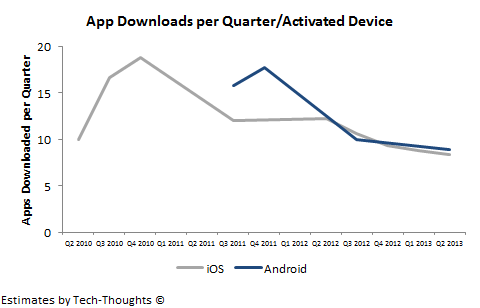 The chart above shows that quarterly app downloads per device are declining for both platforms. Since iOS hit the market earlier, the ratio of install base to cumulative sales should be lower compared to that for Android. This means that the download rate calculated for iOS is slightly inflated compared to Android. However, the trend in download rate interests me more than the actual download rate for each platform. This trend is also likely to be a leading indicator for developer ARPU. This decline has occurred during a period of rising sales of smartphones and an even sharper rise in sales of tablets. While this may seem counter-intuitive, especially given analyst commentary on the matter, this is actually quite natural. As a product category diffuses into the market, it reaches various categories of consumers - from high-end users to mainstream users. High-end users are typically early adopters, with greater spending propensity, and are hence more "engaged" than mainstream users. As product penetration increases, consumers become less "engaged", on average. Therefore, demographic differences that drive increased revenue and engagement are not permanent differentiators.